My first entry into this weekly blog event! This week’s theme is Messy. Check out the other entries over on I heart Faces. 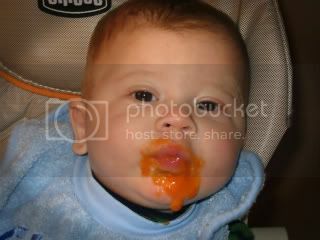 This was taken the first time Ethan had sweet potatoes! He loved them! That is one messy kid! Too cute! Ha, Ha! The puckered lips are too cute! What a darling little mess! LOL, very cute and SO messy! I love how its just dripping off his face. To cute! Awww – what a little cutie!